Fall is just around the corner here in the northern hemisphere, so it’s the time of year when we write observing proposals! And last week, we submitted the first Backyard Worlds: Planet 9 proposal of the season–to follow up some of our brown dwarf candidates using the Astrophysical Research Consortium (ARC) 3.5 meter telescope at Apache Point Observatory. We asked for half a night of time on Near-Infrared Camera & Fabry-Perot Spectrometer (NIC-FPS), to perform J band photometry of 10 objects. Photometry means you take a picture of the object and sometimes a picture of a reference star, and you use the image to figure out how bright your object is. J band corresponds to a wavelength of light of about 1.25 microns, about the size of a virus or a particle of soot. 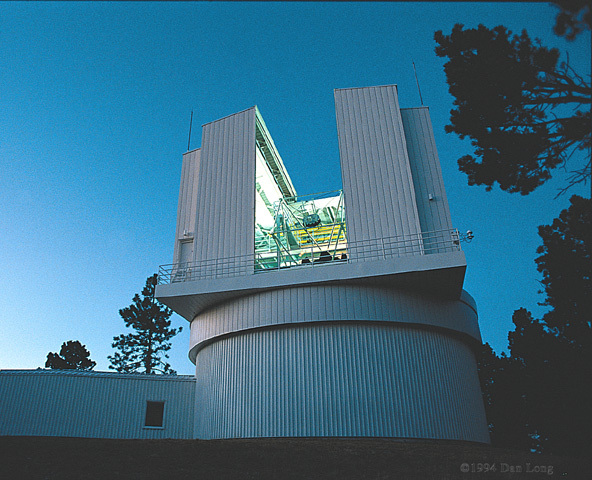 ARC 3.5 meter telescope at Apache Point Observatory, New Mexico. Here’s why we we need these brightness measurements (the photometry). While many of our brown dwarfs have infrared photometry from surveys like 2MASS and Pan-STARRS, the reddest, coldest, and probably the most interesting objects are too faint for these surveys! 2MASS went as faint as about 16th magnitude in J band. Pan-STARRS data goes down to about 21st magnitude in y band (a wavelength of around 1.02 microns). But ultracool brown dwarfs are faint, faint, faint. So we need to make our own measurements. Once we have the new photometry, we will be able to do two new things. First, we will be able to get much better estimates of the spectral types of these objects. As you may recall, the spectral type of the coldest brown dwarfs is Y. Only 25 Y dwarfs are presently known. T dwarfs are the next coldest, but hundreds of T dwarfs are have already been discovered, so Y dwarfs are much more exciting. So far, all we know about the targets we have in mind is that they have WISE colors that are similar to those of Y dwarfs (i.e. brighter in W2 than W1 by at least 2.5 magnitudes). But they might still turn out to be late T dwarfs. The near infrared photometry will help make that distinction. Second, we will be able to apply for time on still larger telescopes to get their near-infrared spectra. The photometry will tell us what instrument we will need, and how long we need to keep the shutter open while were are collecting the spectra. These spectra will tell us for sure what the spectral type is (Y or T? ), and maybe even lead to a big discovery. Here’s a link to the full proposal, if you are curious: APO_BWs The final target list is not set yet, but the 10 targets that meet our cutoff of W1-W2 > 2.5 were found by Guillaume Colin, Sam Goodman and Dan Caselden. Nice work, guys! I’m sure we’ll be writing several more telescope proposals over the next month—stay tuned! Hi! Welcome to the new Backyard Worlds: Planet 9 blog. My name is Marc Kuchner, and I’m excited to begin this search with you. I suppose you could call me the PI of this project, though I blame Dr. Jackie Faherty for coming up with the idea for it. One day, I went to visit the Carnegie Institution Department of Terrestrial Magnetism, where Jackie used to work. I went there to give a talk about another citizen science project of mine called “Disk Detective”. Disk Detective.org is a super-fun ongoing Zooniverse project where we study images of stars using data from NASA’s WISE telescope. After I gave my talk, Jackie came up to me and said: hey, what about examining the moving objects in the WISE images? They could be brown dwarfs or even planet nine! We should launch a new citizen science project to look at those. Here I am giving a talk about Disk Detective. I had my hands full with Disk Detective and other projects, so I more or less ignored Jackie’s idea at first. But then one day I met Dr. Adam Schneider. Adam had been studying moving objects in the WISE images, and he needed help. He had looked at one million WISE images all by himself, hoping to find new nearby brown dwarfs. He had found many! But he was sure the best ones, the coldest, nearest ones, were still hiding in the data. Wouldn’t it be great if he had some friends with fresh eyes to dig deeper into the data with him? A citizen science project would be just the thing. I still wasn’t quite sold on the idea. But then I met Dr. Aaron Meisner. Aaron had just reprocessed all the data from WISE in a new way, dividing it up into several epochs so you could easily see moving objects. He was beginning to scan through the new data set looking for evidence of planet nine. But even with the latest computers and algorithms, his search was bogged down in the galactic plane, where moving objects can easily get lost in crowded fields of stars. Aaron needed help with his search, too. Jackie, Adam and Aaron and I put our heads together, and with lots of help and patience from Laura Trouille and the other folks at Zooniverse, we came up with this project: Backyard Worlds: Planet 9. Brown dwarf expert Joe Fillipazzo, another expert on brown dwarfs, and Shawn Domagal-Goldman, an expert on planetary atmospheres, joined the crew. Matt Beasley from Asteroid Zoo shared his wisdom. Lots of wonderful beta testers showed up. And here we are, after about twelve months of work, just about to launch. Wow. But wait, there’s more! During the beta test, I learned that, in a way, this project had been dreamed up by citizen scientists even before invited them to participate in it. On January 24, 2016, a new topic appeared in the Zooniverse Project Building TALK forum, “planet 9, could someone with access to big telescope data set up a new project to search.” Users @TLSanders, @johnfairweather, @PolishPlanetPursuer, @JeanTate, @zutopian, @PlanetGazer8350, @planetaryscience, and @MvGulik began debating the evidence for a ninth planet, and tinkering with new projects to find it. I hope Backyard Worlds: Planet 9 lives up to their hopes. If you helped with our beta test, thank you! We made many improvements to the site thanks to your feedback. The flipbooks now play automatically and continue to play (unless you stop them). The images now are labeled with celestial coordinates so you can easily look up the interesting sources you find in other astronomical catalogs. There are more examples of each different kind of object of interest (movers, dipoles, planet 9) in the field guide. I think the site really rocks. But if you think of more ideas on how to improve it, please drop us a line on TALK. And thank you to everyone for giving this new project a try. We’ll post more articles and stories right here–you’ll be hearing from other members of the science team as time goes by–and we’ll be chatting with you on TALK. We’re looking forward to getting to know you, and we hope you make a really cool discovery!